Is ignorant Trump going to fire everyone in NASA for telling the truth? Edited by Mario Milano, 07 January 2018 - 07:05 PM. Why are climate-change-deniers clustered in North America? Why are they not spread evenly around the planet? Gee you deliberately ignore when I posted that in Australia when PM Gillard introduced the Carbon Tax she was thrown out of office and the Carbon tax was repealed.....So by your omissions you are a lying whore.....Australia is not part of North America you lying skank grog.. So where the hell is all that global warming I was promised? I can tolerate cold weather to an extent, but what we are experiencing now is a tad extreme. I honestly don’t know how anybody can take this global warming nonsense seriously after experiencing these frigid weather conditions. The people who still believe in it are insane cultists. Much of the United States has been turned into a frozen wasteland. If the earth is really getting warmer, it would not be a frozen wasteland. This is just an objective fact. All of these hoaxers deserve to be gassed with a re-purposed diesel powered Soviet submarine engine for misleading the public with their retarded hoax. NIWA's annual climate summary for 2017 sends a clear message that New Zealand is right to be addressing the impacts and risks of climate change says the Minister for Climate Change, James Shaw. NIWA's data ranks 2017 as the 5th warmest year on record since the Institute began annual measurements in 1909. Seven of the warmest ten years since 1909 have been in the last decade. "NIWA's latest data is in line with patterns of climate change that are becoming clearer every year, and shows why we have a responsibility to future generations to do what we can, as soon as we can, to limit more climate change and prepare for the effects the changing climate is already having," said Mr Shaw. "When you combine NIWA's latest report with New Zealand's new ranking at a 'high hazard' level for most flooding and cyclone events, according to the Global Facility for Disaster Reduction and Recovery, it's clear the government is moving in the right direction by adopting strategies like Zero Carbon legislation to move New Zealand towards a low emissions economy. "In 2018 all New Zealanders will have the chance to participate in setting our national plan for climate action, which will create huge opportunities to increase communities' resilience to extreme weather and, at the same time, make our towns and cities better places to live in. "As we reduce our climate pollution together as a country over the coming decades, we will also invest in infrastructure that will withstand the extreme weather, which even modest amounts of climate change will bring. "Moving public and private sector investment into clean technology and sustainable infrastructure both reduces climate-related risks and sets up New Zealand for a prosperous and stable economic future. "If further warnings were needed that we cannot be complacent, the fact that New Zealand's insurance bill for extreme weather events - at $242 million in the first seven months of last year was five times higher than the bill for 2016 - sends that clear warning," says Mr Shaw. I honestly don’t know how anybody can take this global warming nonsense seriously after experiencing these frigid weather conditions. The people who still believe in it are insane cultists. Much of the United States has been turned into a frozen wasteland. If the earth is really getting warmer, it would not be a frozen wasteland. This is just an objective fact. All of these hoaxers deserve to be gassed with a re-purposed diesel powered Soviet submarine engine for misleading the public with their retarded hoax. Baring a few sceptics like the United States, there is no uncertainty about projections of climate change made by the assessment reports of the United Nations Framework Convention on Climate Change (UNFCCC). It is widely accepted that the incidence and also the intensity of disasters, both natural and man-made, will increase several fold. One recent manifestation of this was Cyclone Ockhi, which originated in the Bay of Bengal but has its landfall in the Arabian Sea. It had impacts in several states - Tamil Nadu, Kerala, Karnataka, Maharastra and Gujarat - to varying degrees. Such disasters will increasingly result in massive economic losses and loss of lives if we are not prepared to deal with them. India, in general, is one of the most hazard-prone countries in the world. Some 60% of the country is prone to earthquakes of moderate to high intensity, 40 million hectares is prone to floods, the 5,700-km long coast is prone to cyclones and tsunamis, and the whole of Himalayas are prone to landslides. Such vulnerability warrants effective measures to deal with disasters. During the first decade of this century, India, with USAID assistance, evolved its District Disaster Management Plans. Today, every district in the country has an effective and realistic District Disaster Management Plan (DDMP) with robust communication, with an effective and efficient database, documented and rehearsed to be activated in the minimum possible time, with user-friendly procedures ensuring active participation by government, community and volunteers at all levels, making optimum utilisation of men, materials and available resources with no gaps, to prevent loss of lives and to minimise loss to property, ensuring the fastest approach for rescue, rehabilitation and to avert further misery for calamity-stricken people. The DDMP guides the entire state machinery engaged in relief operations and enhances the community's capacity to face the eventuality. This evolution of DDMP is a paradigm shift made by India in disaster management from that of the colonial approach of reactive relief to a proactive approach with four stages, starting from a non-disaster stage and passing through just before disaster, during and after it. This shift can be considered first generation reforms in disaster management and were inspired by the Hyogo Framework for Action 2005-2015: Building the Resilience of Nations and Communities to Disasters. The global average annual loss due to disasters is estimated to increase up to $415 billion by 2030 due to the investment requirements in urban infrastructure alone. However, this growth in expected losses is not inevitable, as annual investments of $6 billion in appropriate disaster risk management strategies could generate benefits in terms of risk reduction of $360 billion. This is equivalent to an annual reduction of new and additional expected losses by more than 20%. Such an annual investment in disaster risk reduction represents only 0.1% of the $6 trillion per year that will have to be invested in infrastructure over the next 15 years. However, the current ground situational analysis indicates that at the district level, the last two stages of DDMP received due attention, but the first two stages, which focus more on risk reduction, are not given adequate attention. Hence, there is a need to integrate disaster risk reduction into developmental planning at the district level. The need to bridge this gap is also emphasised in several multilateral conventions and frameworks, such as the Sendai Framework for Disaster Risk Reduction (SFDRR) 2015, the Sustainable Development Goals (SDGs) of Post-2015 Development Agenda, and also at the national level as reflected in the Prime Minister's 10-Point Agenda on Risk Reduction and National Policy on School Safety. It is the time to usher in second generation reforms in disaster management in the country. In addition to integrating disaster risk reduction into district-level planning, another emergent issue that needs priority focus is incorporating child-centric/sensitive planning. Integrating child-centric risk reduction into development planning attains higher significance as our entire national planning is built around the hope of harnessing the 'demographic dividend' to leapfrog our country into the league of developed nations. Streamlining issues like assisted institutional deliveries, bringing down maternal mortality rate, neonatal mortality rate, ensuring complete immunisation, controlling malnutrition, and proper schooling at the district level does not require huge investments. With the existing infrastructure and institutions, significant changes can be brought in through integration of disaster risk reduction strategies into district developmental planning. In this connection, efforts by Karnataka are laudable as it has initiated efforts to revamp DDMPs to infuse the spirit of the Sendai Framework with focus on preparedness and mitigation aspects and also working towards child-centric risk reduction. These changes can be adopted by other states as well. Managing risks rather than managing disasters - or disaster risk reduction - needs to be reinterpreted. I honestly dont know how anybody can take this global warming nonsense seriously after experiencing these frigid weather conditions. Certainly all tax oppressors belong in the same parasite locker. Al Grog is a one horse buggy. The 2017 global land and ocean temperature will likely be among the three hottest years on record, and is expected to be the warmest year without a warming El Niño weather pattern in the tropical Pacific Ocean, according to the World Meteorological Organization, which relies on observations from its 191 member states and territories. The first 11 months of the year were the third warmest on record, behind 2016 and 2015, with much warmer than average conditions dominating much of the world's land and ocean surfaces, according to the U.S. National Oceanic and Atmospheric Administration, NOAA. Arctic temperatures continue to increase at double the rate of the global temperature increase. In addition, sea ice coverage in both the Arctic and Antarctic remain at near record lows, satellite data shows. NASA's Goddard Institute for Space Studies, GISS, and the European Centre for Medium Range Weather Forecasts, ECMWF, Copernicus Climate Change Service both said that the past meteorological year, from December 2016 to November 2017, is the second warmest on record. Now, the World Meteorological Organization will combine datasets from NOAA, NASA GISS, and the Met Office Hadley Centre and Climatic Research Unit (UK) for a consolidated temperature ranking for 2017. "What is more important than the ranking of an individual year is the overall, long-term trend of warming since the late 1970s, and especially this century," said WMO senior scientist Omar Baddour. "Along with rising temperatures, we are seeing more extreme weather with huge socio-economic impacts," he said. NOAA said the month of November was the fifth warmest on record, whilst NASA and ECMWF Copernicus Climate Change Service both said it was the third warmest. Cooling La Niña conditions prevailed across the tropical Pacific Ocean during November 2017. WMO's latest Update indicates that weak La Niña conditions are expected to persist through the Northern Hemisphere winter. During November 2017, warmer-than-average temperatures dominated across much of the world's land and ocean surfaces, with the most notable temperature departures from average across the Northern Hemisphere. Parts of the western contiguous United States, northern Canada, northern and western Alaska, western Asia and Far Eastern Russia had temperature departures from average that were +2.0°C (+3.6°F) or greater, according to NOAA. "While 2017 saw fewer records shattered than in 2016, the Arctic shows no sign of returning to the reliably frozen region it was decades ago," says the Arctic Report Card. As an indication of swift regional climate change in and near the Arctic, the average temperature observed at the weather station at Utqiagvik, Alaska has now changed so rapidly that it triggered an algorithm designed to detect artificial changes in a station's instrumentation or environment. Utqiagvik (say OOT-ki-aag'-vik) sits near Point Barrow, the northernmost point in America, on the Arctic Coast of northern Alaska. Now recognized by its Iñupiat place name, it is still commonly known as "Barrow." Elsewhere in the Arctic, a separate analysis from the European ECMWF Copernicus Climate Change service found November's temperature was more than 6°Celsius above average in parts of Svalbard, Norway as it was in October. The Arctic Report Card provides an annual update on how the region is faring environmentally, and compares these observations to the long-term record. This information can be used to inform decisions on adaptation by local, tribal, state and federal leaders as they confront both the obstacles and the possibilities posed by a changing climate to economic growth, national security, public safety and natural resource conservation. "The rapid and dramatic changes we continue to see in the Arctic present major challenges and opportunities," said retired Navy Rear Adm. Timothy Gallaudet, Ph.D., acting NOAA administrator, who led the press conference to release the report card. "This year's Arctic Report Card is a powerful argument for why we need long-term sustained Arctic observations to support the decisions that we will need to make to improve the economic well-being for Arctic communities, national security, environmental health and food security," said Gallaudet. Declining sea ice. This year's maximum winter sea ice area, measured each March, was the lowest ever observed, while this year's minimum area, measured each September, was eighth-lowest on record. Sea ice is also getting thinner each year, with year-old ice comprising 79 percent of coverage, and multi-year ice just 21 percent. In 1985, multi-year ice accounted for 45 percent of sea ice. Greener tundra. Overall vegetation, including plants getting bigger and leafier, and shrubs and trees taking over grassland or tundra, increased across the Arctic in 2015 and 2016, as measured by satellite. The greatest increases over the last three decades are occurring on the North Slope of Alaska, Canada's tundra and Taimyr Peninsula of Siberia. The annual report on vegetation is based largely on data from sensors aboard NOAA weather satellites. Snow cover up in Asia, down in North America. For the 11th year in the past 12, snow cover in the North American Arctic was below average, with communities experiencing earlier snow melt. The Eurasian part of the Arctic saw above average snow cover extent in 2017, the first time that's happened since 2005. This year's report card also includes special reports on how the warming trend is affecting valuable fisheries in the eastern Bering Sea; compromising roads, homes and infrastructure due to permafrost thaw; and threatening the high latitudes with increasingly frequent wildfires. A separate report, published in the Bulletin of the American Meteorological Society, BAMS, said that last year's record global average temperatures, extreme heat over Asia, and unusually warm waters in the Bering Sea would not have been possible without human-caused climate change. "This report marks a fundamental change," says Jeff Rosenfeld, editor-in-chief of BAMS. "For years scientists have known humans are changing the risk of some extremes. But finding multiple extreme events that weren't even possible without human influence makes clear that we're experiencing new weather, because we've made a new climate." 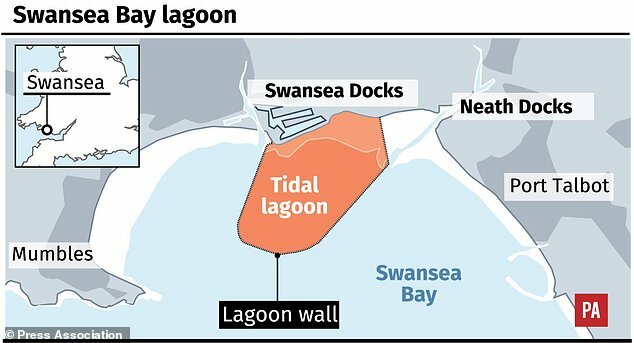 A giant clock in Swansea city centre has begun counting down the days until the one-year anniversary of the Hendry Review, which voiced support for the Swansea Bay Tidal Lagoon project. The move by Swansea Council aims to highlight the government's slow pace in responding to the report, which was published on the 12th of January last year, more than 300 days ago. It now hopes to pressure the Department for Business, Energy and Industrial Strategy (BEIS) into voicing its stance on the £1.3 billion renewable project. The government originally commissioned the review to judge whether the site would be a worthwhile investment for the UK as it transitions to a low carbon energy system. The facility would be expected to produce around 320MW of electricity, enough to power 150,000 homes. Damn you GloBULL warming....oh wait...wasn't snow a thing of the past in the year 2000 according to the GloBULL warming cult? A snow grader clears a path on a dangerous road in Nanzhang county, Hubei province. Heavy snowfall in China continued to wreak havoc on Monday, damaging houses, agriculture and power facilities, with authorities saying 21 people have been killed and millions hit in the last one week. The provinces that have been badly hit by the weather are Anhui, Henan, Jiangsu, Hubei, Hunan, Shaanxi, Shanxi and Chongqing Municipality, the China National Commission for Disaster Reduction said. More than 3,700 people have been relocated and 14,000 are in need of emergency assistance, said the commission, noting that over 700 houses had collapsed and nearly 2,800 were damaged, state-run Xinhua news agency reported. The weather has affected more than 2,33,100 hectares of farmland, with more than 8,100 hectares destroyed, causing direct economic losses of 5.55 billion yuan ($854 million), it said. Nineteen expressways in northeast Liaoning province have been closed or controlled since the snow started last night, according to local transport authorities. The snow will result in icy roads, the local observatory said in its forecast. Liaoning will see temperatures plunge by up to 10 degrees Celsius due to the snowfall, it said. In Xinyang city, central China's Henan province, snowfall from Wednesday to Friday, the worst since local records began in 1951, killed one person and injured three others. Primary and middle schools in the city have suspended classes since Thursday. The disaster flattened 26 houses and damaged over 2,000 hectares of crops, causing total economic losses of 219 million yuan ($33.8 million), officials said. In eastern China's Anhui province, quilts and coats have been distributed to residents to withstand the biting cold, following heavy snow since Wednesday, the worst in Anhui since 2008. 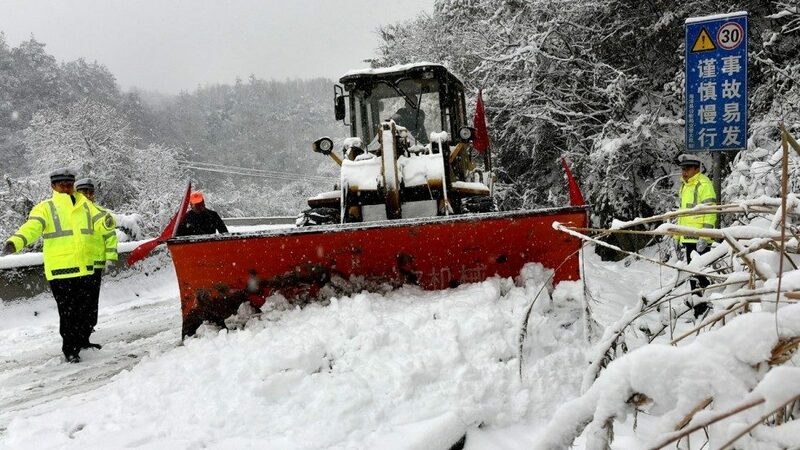 The snow has affected 1.5 million people and damaged over 1,60,000 hectares of crops, causing total economic losses of 3.5 billion yuan, Xinhua quoted the provincial government as saying. Meanwhile, the meteorological authority today renewed a yellow alert for a cold front across the country. From Tuesday to Wednesday, the temperature is expected to drop by six to eight degrees Celsius in northern, northeastern, central and southern China, including parts of Inner Mongolia and Yunnan, the National Meteorological Center (NMC) said. China has a four-tier colour-coded weather warning system, with red being the most severe, followed by orange, yellow and blue. Edited by Mario Milano, 09 January 2018 - 12:30 PM.